Pictured: Loriun has received $80,000 over seven years from Grameen America, helping her expand her bakery, open an electronics shop, and set long term goals of opening her own restaurant. Take a moment and think back to the last loan you applied for. Chances are, it was for a big investment—a car, a home, a college education. Now imagine if you couldn’t get that loan. For most of us, it would be impossible to afford these life-changing purchases or attain these milestones. Most of the more than 40 million Americans living below the poverty line (defined as a family of four living on $25,100 or less), can’t access a conventional loan or life-changing capital. With microloans, entrepreneurs can receive small amounts of money—typically $500 to $50,000—at low interest rates to grow their businesses, and in turn, improve their lives and that of their families, and contribute to the success of their communities. Bill Gates, Steve Jobs, Jeff Bezos, Sara Blakely, Elon Musk—none of these influential entrepreneurs could have built their businesses without access to capital. Microloans provide entrepreneurs with money for the supplies, infrastructure, inventory, marketing, and more that they need to succeed. This means that even those without wealth, access, or privilege can turn a bright idea into a thriving, profitable business. Take Joann, an entrepreneur who needed to raise awareness about her baking business. 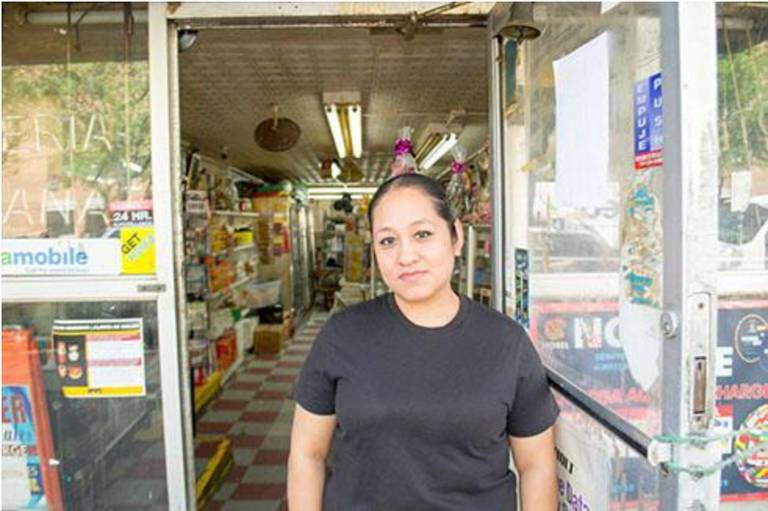 With a $1,500 loan from Grameen America, Joann invested in marketing materials that generated buzz and allowed her business to expand. When demand surpassed her capacity, a second loan of $2,000 allowed Joann to buy new baking pans so she could take on bigger orders and service larger food fairs. Globally and in the United States, women still earn less, own less, and remain disproportionately vulnerable to poverty. Women are more likely to be excluded from the financial mainstream and are less likely to have a credit score or a bank account. Women receive only 4 percent of small business loans in the United States, but many want to launch or grow their small businesses. In fact, the number of businesses owned by women in the U.S. has more than doubled over the last 20 years. Providing microloans to women entrepreneurs is an effective way to create jobs and generate income where it is needed most. Many people don’t have enough income to support their basic needs or the needs of their families. By equipping small businesses with capital, microloans enable them to grow and become profitable. The income generated by these ventures not only empowers the entrepreneur to begin to move out of poverty, it also creates opportunities for other community members to do the same. Research shows us that even small businesses with fewer than 20 employees have created more than 20 million jobs in a single year. Buying from small, locally-owned businesses is a great way to invest in your local economy. While only 14 percent of money from chain store purchases recirculates in the community, 48 percent of each purchase at local, independent businesses stays local. By enabling more small businesses to thrive, microloans create more opportunities in local economies, creating ripple effects. For many Americans in poverty, healthcare is a luxury they cannot afford. The highest-earning Americans spend more than three times on healthcare than the lowest-earning households, resulting in significant health discrepancies. Microloans enable businesses to succeed and generate income for entrepreneurs and their employees. With greater income comes a greater capacity to spend on health-related expenses, including preventative care. Research shows that investing in women entrepreneurs in particular has a multiplier effect, positively affecting the health of families and generations to come. While microloans start with empowering an entrepreneur, the positive impact is soon felt by the whole community. By making capital accessible to all, microloans ignite a chain reaction that begins with successful businesses and results in empowered individuals, healthier families, thriving communities, and stronger local economies. To learn more about the impact of microloans and how you can get involved, visit www.grameenamerica.org.